I have been wanting to make a navy and pink quilt for a while. Here is my first fabric pull. I'd like darker navy and nice saturated pinks. As you can see, it is okay for other colors to be in there as long as it still reads navy and pink. To make all 3 of your blocks you will need a total of 6 fabrics - 3 navy and 3 pink. Here is what I will be using to make my samples. Cut the 3 larger squares on the diagonal. Separate the pieces into 2 piles (1 of each triangle and one square in each) they will go into 2 different squares. You will use 4 different fabrics for each block (2 navy and 2 pink). Here are my fabrics for the first block. Start by sewing the 4 squares together. Now sew the C triangles to your 4 patch, paying attention to placement. Round 1 should measure approximately 6 1/2" square. Trim if necessary. Continue in the same way for round 2 using B triangles. Trim to 9" square. Finally, add A triangles for round 3 and square to 12 1/2" square. Repeat 2 more times for a total of 3 blocks. And, so that you can see the pattern emerging, here are 9 blocks all together. Have fun! And let me know if you have any questions. I started 2017 with A LOT of quilty goals! I have a long list of WIPs, UFO, quilt alongs, patterns and fabric bundles that I want to play with, as well as some shop samples and designs and customer requests. So, I decided the best thing to do was WRITE IT DOWN! I figured if I write it down and can cross it off I will be more likely to do it. So far, so good. 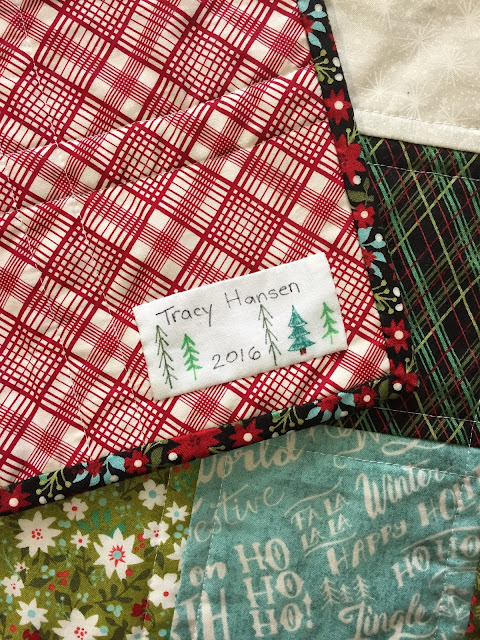 Each month I've got a balance of old projects to complete, quilt alongs to keep up with, customer orders, shop stuff, new patterns and pretty bundles. My January list was long, and except for one project, I got it all marked off. 1. 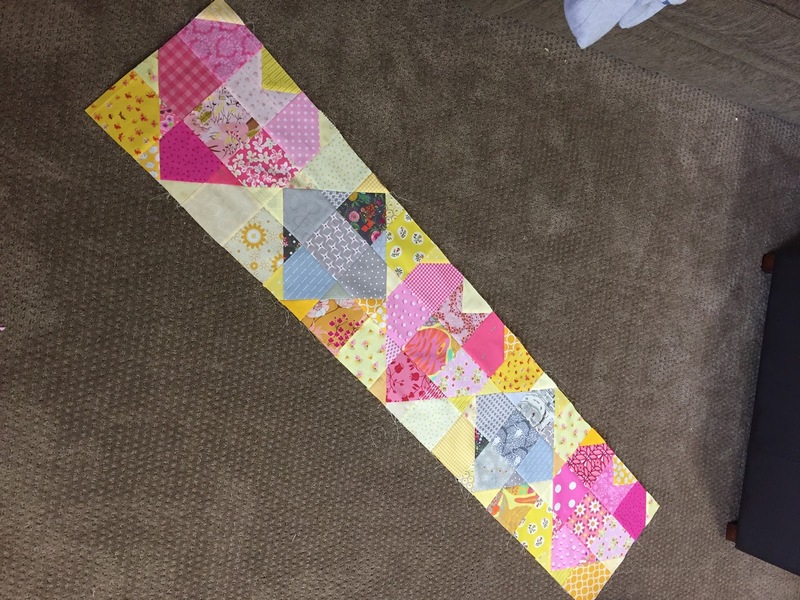 Sweet Love quilt - started and finished in one month. Whoop! 4. Comfort Quilt - finished and turned in 1 comfort quilt. 5. Bind and Label 3 quilts - Done! Including getting labels on some older quilts. 9. Pillowcases for Matthew - done and being mailed this week. A while back I finished this gorgeous quilt kit from Michael Miller fabrics and of course ended up with a pile of scraps. I love scraps! And usually after I finish a project, the scraps immediately get broken up and distributed by size, color etc. But these scraps just seemed to want to stay together. so, they have sat for more than a year just hanging out. One of my quilty goals for this year is to get some of these WIP and stacks of saved fabric taken care of! So, on my list for January was to do something with the leftovers from this quilt. This stack included large 1 yard pieces all the way down to strips of 2 1/2 inches. I needed a pattern that could use up some smaller pieces as well as some bigger cuts for the bigger designs. 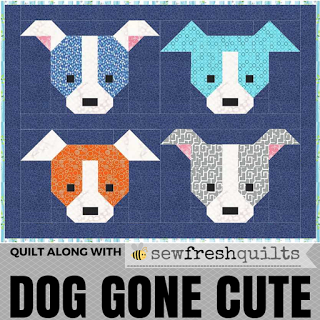 I decided on the Scrappy Summer Quilt by Cluck Cluck Sew. It was perfect for a scrappy quilt!! I ran out of the white with black dots fabric that I was using for the "white" blocks, so I bought about 2/3 yards of a similar dot. I think the different sized dots just add to the scrappy feel. I really enjoyed the tutorial for this quilt and will absolutely be using it again. It was a quick and easy way to use up those scraps. Even though I am sure this quilt top and backing will be hanging in my closet unquilted for some time, I feel better knowing that those scraps are all sewn together. So, I really thought that this year I would only be working on two quilts for the Rainbow Scrap Challenge. Silly me. LOL! When I saw the Slow Sewing Quilt Along with Pen and Paper Pattern's new Garden Snail Pattern, I knew that I had to make them. So, it looks like I will be playing with some snails this year. First up are some cute little purple snails. And if the snails weren't enough, I decided to pull out my copy of the Forest Friends pattern. The RSC will be a great way to work my way through these cuties. Here are my purple friends. Here is to another fun year of working through those scraps and turning into something beautiful!